You can expect to see the snake oil salesman picking examples of heavy rain and more especially hail as “Evidence!” of an ice age even tho the heavy precipitation is due to warm oceans and displaced Arctic air over parts of Canada. Hail, I repeat once more, is formed high up in the atmosphere in the strong convection of big thunderstorms. That is why hail can fall on a warm January day in Adelaide! Hail has N O T H I N G to do with supposed surface cooling. Look up “hail” in wiki. As the globe heats and more water evaporates off warmer seas into warmer air and storms are fed more heat as well as more moisture you can expect hailstones to increase in size somewhat. As storms are fed more energy you can expect more lightning—and, yes, the snake oil seller has claimed lightning as a sign of the ice age. Easy when you don’t need to know science to make a case. I repeat again, if the globe was actually cooling significantly (more than the 0.13°C cooling a GSM would cause) then seas and air would be cooler and evaporation and hence precipitation would be less. The reference mean sea level (Topex/Poseidon, Jason-1, Jason-2 and Jason-3) since January 1993 (left) is calculated after removing the annual and semi-annual signals. A 2-month filter is applied to the red points, while a 6-month filter is used on the blue curve. 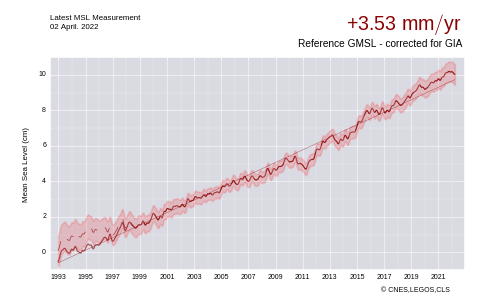 By applying the postglacial rebound correction (-0.3 mm/year), the rise in mean sea level has thus been estimated as 3.33 mm/year (mean slope of the plotted data). 2. Thermal expansion as oceans warm. Heat water and it expands. We have seen how the big glaciers draining the icesheets in East and West Antarctica are retreating. As warm currents from the oceans reach Antarctica the grounding lines, where the boundary between ice resting on bedrock and ice that floats on seawater, retreat, undercutting the glaciers. At some time the ice floating on seawater will break off and float away. Combined map of regional patterns of observed sea level (in mm/year). This map can be obtained using gridded, multi-mission Ssalto/Duacs data since 1993, which enable the local slopes to be estimated with a very high resolution (1/4 of a degree on a Cartesian projection). 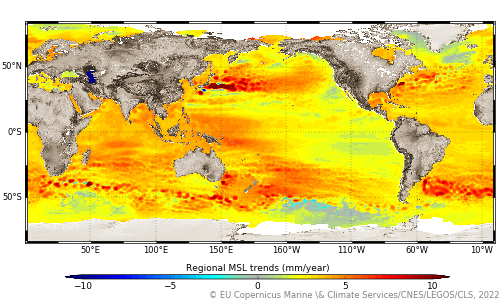 Isolated variations in MSL are thus revealed, mainly in the major ocean currents and ENSO events (Credits EU Copernicus Marine Service, CLS, Cnes, Legos). Note the strong sea level rise in the Gulf and off the US east coast, a sign of the slowing AMOC. (Since 2010, the rate of sea level rise has again accelerated. And it appears that El Nino years have recently tended to produce strong upward swings in the annual rate of increase. This may be due to El Nino’s tendency to set up stronger cycles of energy transfer to the poles. NOAA presently indicates a 50 percent chance that a mild to moderate El Nino will emerge during the winter of 2018-2019. Will we see another sea level spike at that time should El Nino emerge? The coming El Nino will be mild. How long before we get another strong El Nino? What will happen to sea level rise then? The fact that sea levels are rising completely negates any weak argument that we are in an ice age due to a GSM. I have never seen any of the ice age frauds provide any evidence that we are moving into a GSM. Never. Melting has restarted on the south east coast of Greenland in the last couple of days. The alert level for two bushfires nearing a township of 35,000 people in the south of Western Australia has been downgraded as firefighters manage to halt the blazes’ destructive paths. Firefighters have been battling more than 30 active fires in the region, after a prescribed burn escaped containment lines and winds from the season’s first strong cold front fanned flames on Thursday night. Nearly winter and there is a destructive bushfire! Note it was another prescribed burn that went out of control—the extended bushfire season (and wildfire season globally) makes fuel reduction burns very difficult! Scientists are warning that rice — one of the world's most important cereal crops and the primary food source for more than 2 billion people — may become less nutritious in the future. Researchers in Japan and China have found that protein, iron and zinc levels in rice all fell significantly when grown in higher carbon dioxide environments. For the experiments, scientists built 17-metre-wide octagons in Japanese and Chinese rice paddies that pumped carbon dioxide to simulate the kind of CO2 concentrations expected in the next 50 years (568-590 parts per million). The research, published in the journal Science Advances, found on average from the varieties tested, protein levels fell by 10 per cent, zinc 8 per cent and iron 5 per cent. Levels of vitamins B1, B2, B5, and B9 also fell — though results were far more varied. "When we looked at vitamin B we looked at nine different varieties from Japan and China and they interestingly responded to high CO2 concentration in different ways," the University of Tokyo's Kazuhiko Kobayashi said. "Some varieties showed a very large decline, some varieties much less a drop of vitamin contents." Well, I only heard about protein levels (nitrogen uptake) before but it seems mineral and vitamin levels also drop. The experiment controlled for CO2 concentration. It did not control for the warming 500ppm+ of CO2 causes so add that and the future for nutrition looks pretty bleak! Malthus will not be denied! ABC article based on this paper. Baltimore suffers second once in a thousand year flood. Flooding in a LOT of places. But all that hot water off the coast of the US heavy rain is not exactly unexpected. Booby is orgasming in his unwashed underpants at the fronts etc coming from Antarctica. Lowest temperatures for two years! Me, I wonder if we are getting more Antarctic weather/weather systems then before and if that is due to the weaker, chaotic southern Jet Stream. Antarctic air hitting the SE of Australia cools that part of the country—but the absence of that cold air from Antarctica means Antarctica warms up temporarily—globally no change you see? Couple of years ago cold air from the Antarctic Peninsula headed north and hit the east coast of Australia and travelled north bringing snow even to southern Queensland. Same principle—Australia got a bit colder but Antarctica must have temporarily warmed. Definitely we are getting more weather/systems reaching us from Antarctica and undoubtedly that is to do with the weakening of the southern Jet Stream. Weakening due to AGW. yeah .. the ice loss from Antarctica is increasing exponentially, or more , each year. Data released today says it has increased 3-fold since 2012 (?) .. you must be across this Monk. Bottom line is if it keeps melting, all the way world-wide sea levels would rise 60 metres. !! Now that's a bit of a worry. Yeah, 200 Gton a year now, compared to 280 Gton from Greenland. Heave a look at the next thread—beautiful shots of Planet Earth. Hurricanes are not the only storms. In Australia they are called Tropical Cyclones, in the Far East they are called Typhoons. They are the same thing. TCs are getting stronger and they are moving slower, increasing the devastation on land. It seems aerosols (sulphites) might be masking AGW and the intensity of storms: as the population in China insists on cleaner air those aerosols will be controlled for like they were in America and Europe earlier. As the Earth’s atmosphere warms, the atmospheric circulation changes. These changes vary by region and time of year, but there is evidence that anthropogenic warming causes a general weakening of summertime tropical circulation1–8. Because tropical cyclones are carried along within their ambient environmental wind, there is a plausible a priori expectation that the translation speed of tropical cyclones has slowed with warming. In addition to circulation changes, anthropogenic warming causes increases in atmospheric water-vapour capacity, which are generally expected to increase precipitation rates9. Rain rates near the centres of tropical cyclones are also expected to increase with increasing global temperatures10–12. The amount of tropical-cyclone-related rainfall that any given local area will experience is proportional to the rain rates and inversely proportional to the translation speeds of tropical cyclones. Here I show that tropical-cyclone translation speed has decreased globally by 10 per cent over the period 1949–2016, which is very likely to have compounded, and possibly dominated, any increases in local rainfall totals that may have occurred as a result of increased tropical-cyclone rain rates. The magnitude of the slowdown varies substantially by region and by latitude, but is generally consistent with expected changes in atmospheric circulation forced by anthropogenic emissions. Of particular importance is the slowdown of 30 per cent and 20 per cent over land areas affected by western North Pacific and North Atlantic tropical cyclones, respectively, and the slowdown of 19 per cent over land areas in the Australian region. The unprecedented rainfall totals associated with the ‘stall’ of Hurricane Harvey13–15 over Texas in 2017 provide a notable example of the relationship between regional rainfall amounts and tropical-cyclone translation speed. Any systematic past or future change in the translation speed of tropical cyclones, particularly over land, is therefore highly relevant when considering potential changes in local rainfall totals. Re the “anthropogenic warming causes increases in atmospheric water-vapour capacity” the warmer air now can hold close to 8% more moisture than early 1900s air could. Not surprising that precipitation has increased. As seas and air warm then we have warmer, moister air. Over land, which of course also warms, thermals will be bigger. So thunderstorms will have stronger thermals, updrafts. That sends the moist, warm air high up in the atmosphere where air pressure is less and temperatures colder. Adiabatic cooling, the cooling you get on expansion of a gas cools the moist air further and the moisture condenses and freezes. A tiny nuclei of ice can have more water freeze on to it—nucleation. The budding hailstone gets heavier and starts to fall. As it falls it can freeze more ice around it, even freeze other hailstones to itself. Once it drops below the cloud level of the thunderstorm the hail stones are fixed in size. It may be counter-intuitive but AGW will mean more and more precipitation is as hail. here a interesting article monky. Just tweeted a link to your post! We now have 15 users, mostly bots. Do wonders for our Google rankings. Hmmm you posted that on the Dubyne MRB. Lees will log in and ask if you know the problems with the GRACE data. There weren’t any, there was some disagreement on how fast Antarctica was melting. hehe I only post there to stir them up a bit....... Talking to them about AGW is like herding cats. HBS Guy wrote: Hmmm you posted that on the Dubyne MRB. Lees will log in and ask if you know the problems with the GRACE data. that would be the GRACE satellite that showed net ice loss as opposed to NASA's Jay Zwally's study that showed a net ice gain. GRACE has also been found to be deficient elsewhere. DonDeeHippy wrote: hehe I only post there to stir them up a bit....... Talking to them about AGW is like herding cats. Ask him exactly where GRACE has been found deficient? It hasn’t at all AFAIK. Ok done hehe I feel like I’m cheeting at a test but it’s pretty funny. Ahahaha he has a little repertoire of tricks and uses them over and over. 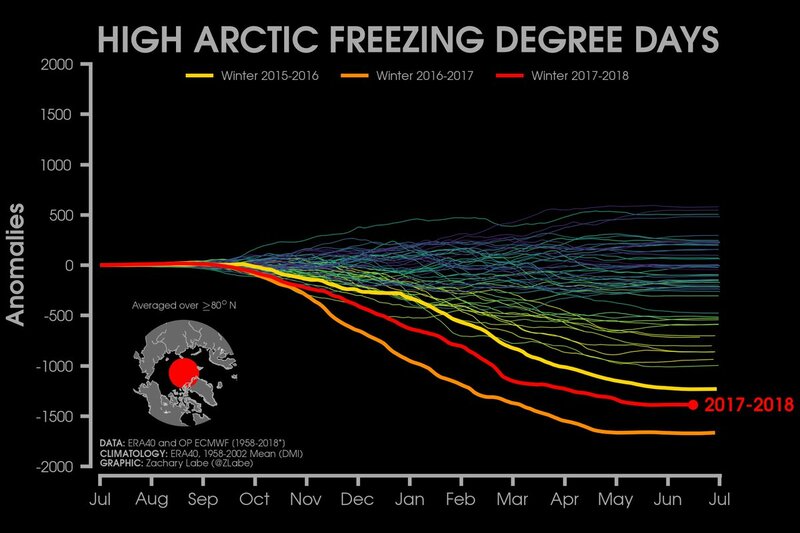 Fewer Arctic freezing degree days in winter north of 80°N lately. Heat in Western USA to spread to the east. Wet bulb temperatures in not that many years in parts of the tropics and the SE of the US will be high enough to kill a healthy adult just sitting in the shade. With the high Atlantic and Gulf of Mexico temperatures high wet bulb temperatures will make life uncomfortable—you can’t cool by sweating!